We’re excited to bring the first change tool to you, Change Data Source for Crystal Reports. Though many of you seem shy to post in the forums (we don’t bite, promise! ), we’ve been receiving your feedback on how anxious you’ve been to have this functionality available. 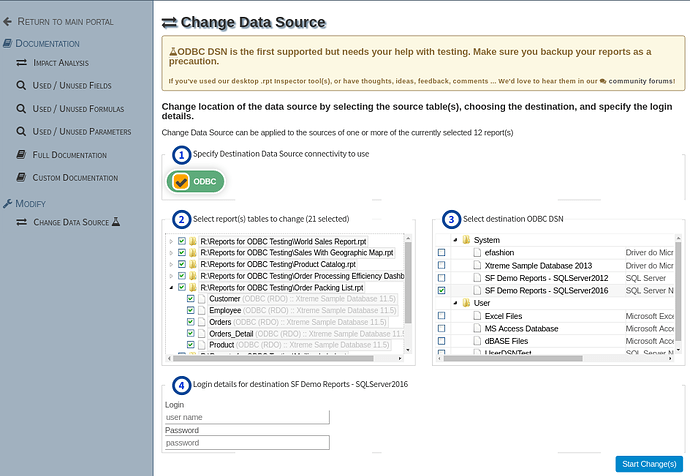 We know most of you use the Change Data Source / Database conversion and migration wizard in our desktop .rpt Inspector Professional and/or .rpt Inspector Enterprise Suite and that you’ve been eagerly waiting for this feature to become available. With the initial release of the Crystal Reports Change Data Source we’re supporting the ODBC connectivity method first. This connectivity method is the most often used with our desktop tools and we’ve significantly reduced the complexity (compared to the desktop wizard) but are only doing a set location (for now? let us know if you require more). As with other .rpt Inspector Online tools, you start by selecting the report(s) for which you want to make a data source change and then click on the Change Data Source tool in the left side navigation. Then you specify the connectivity method (for now only ODBC is available), specify the tables in the reports to affect, specify the destination System or User DSN, and then specify the user name and password for the destination DSN. .rpt Inspector Online’s Change Data Source tool for Crystal Reports will then proceed to make the changes you requested. This tool carries our labs icon, which means that you should make sure that you backup your reports before using as we’re still testing this tool and evolving its features. We’d love to hear your thoughts. The below screen shot shows changing 21 tables across 12 reports from an ODBC DSN called Xtreme Sample Database 11.5 which is using an Access Database to an ODBC DSN called SF Demo Reports - SQLServer2016 which is using a SQL Server Native driver for SQL Server 2016. The source report(s) tables don’t have to only be based on ODBC DSN, they can be OLE DB and Native Driver too though as of now we’ve done limited testing and would love for your help here as well as further testing reports built on views and stored procedures. .rpt Inspector Online now in public beta phase!